As the last passenger jumps aboard and the anchor is pulled in, the outboard motor roars into life, throwing us to one side as the boat rips through the white foam of a breaker and whisks us around a rocky bluff and out into the open sea. Heading directly into the heavy swell, the fishing boat rears and falls with a heavy bang... bang... bang... as we head out to deeper water. Despite a clear azure sky and bright sun, the trip is more like a rollercoaster ride today. As Amado, the boatman, slackens off the throttle we are momentarily left at the sea's mercy - a slight pause on the crest of each wave followed by a stomach churning drop and the next impact. Those at the back are getting soaked and the rest of us grip onto the seats for dear life. The boy at the front of the boat, however, an impish grin spread across his face, stands upright and holds on to the anchor rope as if he's riding a bucking bronco. It's rough, but safe, I guess. Amado is certainly enjoying himself, giving the tourists a ride they won't forget in a hurry. "Is fun, no?" he shouts above the squeals of the two Spanish girls sitting in front of him, a huge grin showing his perfect teeth, his muscular fisherman's torso glistening wet in the morning sun. "Could you be loved..." the Spanish girls sing back to him, giggling and making jokes about his name. Those who'd been up partying the night before, attempting to dance to Choroni's famous tambores and drinking guarapita, look a little worse for wear. A couple of bottles of the local passion-fruit-and-cane-alcohol jungle juice certainly seems like a good idea when the party's going full tilt. But a 25-minute boat trip through rough seas the morning after with a hungover fisherman in charge - and without the aid of a solid breakfast or a lifejacket - can put rather a different perspective on things. Coming round the first bluff we catch our first glimpse of Choroni's glorious palm-fringed beach, Playa Grande. The view of the thick forest stretching lazily into the distance until it merges with the cloud-shrouded mountains of the Henri Pittier National Park resets the smiles on a few faces. It's easy to see from this perspective how blessed Choroni is. Unlike most of Venezuela's beaches where the town or village sits directly behind the beach, Playa Grande is thankfully separated from Puerto Colombia by a bridge and a road. The other benefit of being separated from the town is that the beach is not contaminated by the two rivers that run either side of the fishing village. If only all Venezuelan beaches were so clean. Luckily, the coconut plantation at the back of the beach is owned by a family who have refused to sell out to hotel consortiums and fast food chains. There was a rumour once that McDonalds wanted to build a restaurant slap bang in the middle of the beach after the lifeguards' chairs started to sport the familiar Golden Arches logo. It's hard to think of a worse defilement. From the sea, the coast looks like the perfect picture postcard of a Caribbean paradise, the hand of man noticeably absent as we pass rugged cliffs, sea caves and sandy coves. Amado points out Playa Seca, a small beach with a natural pool in front that provides good snorkelling. With no shade trees and little in the way of greenery, except for prickly cacti and a few low shrubs, it is well named. Finally, a last heart-pounding round of rollercoasting waves brings us into the wide bay of Puerto Chuao. Amado takes us right in, close to the beach, and we do a victory lap along the full length at top speed. It's an exhilirating arrival, but we're the only ones to enjoy it as the beach is deserted. The beach here is different to Playa Grande: the sea looks black in places from the leaves washed down the river from the plantation. There's a vicious undertow that can you drag you under and spit you out when it's rough. There's also less shade, fewer palm trees and only one place to get snacks and drinks, up on the sea wall. That said, coming from a heavy weekend at Choroni, it is blissfully empty. After a quick dip to freshen up we head off for the Colonial village of Chuao and its world famous cacao plantation, leaving the Spanish girls slapping on factor fifty for a day of serious sunbathing. The village is only 5 kms from the sea but it takes over an hour to walk there. Amazingly, considering Chuao can only be reached by sea or after a two day walk on a mule-trail from Turmero near Maracay, a por puesto bus is doing a shuttle service from the beach to the village. Like everything else here it was brought by sea, loaded onto three fishing boats strapped together side by side. Roll on, roll off, Chuao style. But we hadn't come here for a bus trip but a walk through the lush cocoa plantation with its huge shade trees of mango, guamo and cedar. In the shadow of these 300-year-old forest giants are tall breadfruit trees, signs of the plantations' slave history. Brought to the Caribbean from Polynesia by Captain William Bligh of "Mutiny on the Bounty" fame, the breadfruit with its spiky leaves and football-sized fruit was planted to feed slaves shipped over from Africa. It still constitutes an important part of the diet of the 300 inhabitants of Chuao, who work the plantation as a collective. The wide path that leads to the village is bordered by stumpy cacao trees. Surprisingly, the bulbous fruit pods - in various shades of purple, yellow, green and red - grow straight from the trunk. It's incredible to think that the best chocolate in the world, "the Rolls Royce of chocolate" according to one Italian chocolatier, is made from these odd-looking pods and the bitter tasting criollo beans inside. Leaving the path, we crunch our way through the thick leaf litter of the shade forest and soon come across a cluster of women wearing wellington boots and carrying machetes and buckets full of beans. Humming a song to keep a constant rhythm, they display an incredible economy of movement: lifting the fallen cocoa pods with the point of the machete, opening them with a whack and then scooping out the beans in one fluid motion. It is a practice that is centuries old, unchanged since the 17th and 18th centuries when Venezuelans built fortunes from these cocoa beans and the rich elite were known as "Los Grandes Cacaos". 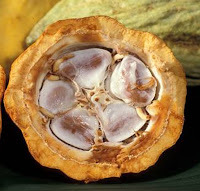 Until recently it was believed that the cocoa tree was introduced from Mexico by the Spanish, but archaeological finds of pre-Colombian ceramic urns in the shape of cocoa pods around Lake Valencia prove that it is endemic to Venezuela. Though it is hot and humid in the forest, the women are covered from head to toe. As swarms of forest flies descend on us and start to feast, we realize why and beat a hasty retreat to the path. Amado, born and brought up in Chuao, explains that only a small portion of the plantation is still worked and yields are low, although a new surge in demand for fine chocolate has brought more cash to the cooperative and renewed life to the village. "Only the older people used to stay," he says. 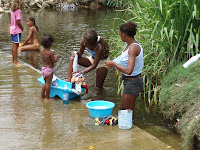 "School kids study in Maracay and the young men work in fishing or in the big cities. There's no hospital, cinema or shops here. It looks beautiful, but it's a hard life." Amado himself left as a young man to work on the fishing boats in Puerto Colombia, but comes back regularly with tourists or for the annual fiestas that the town is famous for. On the Feast of Corpus Christi, for example, the men of the town dress up for a riotous three-day revel of dancing devils or "Diablos Danzantes". The other festival is the June 23 and 24 all-nighter in honour of San Juan Bautista, a drum festival with its roots in Africa. The first thing that hits you on entering the village is the unmistakably tangy smell of the cocoa beans drying on the large patio in front of the blue and white 17th century church. Following our noses we find dried beans fermenting under banana leaves in the buildings close by. It's a real island in time. The village dates back to 1568 when Spaniard Juan Desque was given the Chuao valley as an encomienda. This gave him complete control over the indigenous inhabitants who were forced to work, while he in return offered them "protection". The system was considered humane, because according to the Law of the Indies, which governed the Spanish colonies in the New World, the native people were not slaves but merely serfs. In reality the cruelties inflicted on the Indians under this enforced serfdom outdid the later horrors of slavery. Behind the church is a small, dusty museum with a few artefacts from colonial times, devil dance masks, and some broken sherds of pre-Colombian pottery. It is locked but we soon find somebody who knows where the key is kept. Francois, a French guy we meet by the river says the sleepy village, drowsing in the midday heat, reminds him strongly of Africa: the shoeless kids chasing each other in the street, the men playing an unhurried game of dominoes outside the general store, women washing clothes in the river. With its slow pace of life, Chuao seems to be the perfect escape from the hectic rat race of London, Paris or New York, but while we see the positives the villagers face some very real economic pressures that are forcing the young to migrate in ever-increasing numbers. One positive development has been the arrival of the Italian connoisseur chocolate company Amedei, which is run by brother and sister Alessio and Cecelia Tessieri in Tuscany. 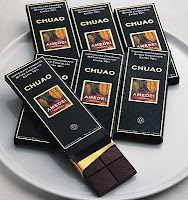 Considered one of the finest single-origin chocolate producers in the world, their "Chuao" range, using only criollo beans from the village, has taken the gold medal for the last two years at the Academy of Chocolate awards. The marketing on their website certainly doesn't hold back its praise: "Chuao is a ferocious deluge of blackened fruits and molasses, poised to trample all timid palates that dare stand in its path," states the blurb, "with a flavor this complex, this commanding, this divine, the price tag that each 50g bar demands is without a doubt a justifiable price to pay for a glimpse into heaven." Making our way to the far end of the village we pass a wattle-and-daub house with its wooden ribs exposed, an open door revealing walls decorated with yellowing newspapers and pages cut from magazines. Virtually bare of furniture, the room is dominated by a pair of massive speakers pumping out salsa and merengue like the party is in full swing. Sat next to them, as if nothing is happening, is a white-haired old lady in a rocking chair who smiles sweetly at us as we pass. Hot and tired we slip gratefully into a large pool of cool river water upstream from the village. As we lay in the shallows, our heads just above the water the local kids show off by diving from the rocks. Half an hour later, with a few ice-cold beers inside us, we are on the por puesto headed for the beach and a fish supper. No more Cadbury's Flakes or Hersheys bars for me, tucked away in my bag I've got some of the real stuff, a tennis ball of Chuao chocolate wrapped in silver foil. Nice post Russ! And takes me down memory lane, too. Brill article Russ, really enjoyed reading it. There you are in paradise.....with merengue! Lovely blog, mate! Stumbled upon it yesterday and can't get enough of it! It's nice to take a trip through my native country via your reports. I'm currently planning a backpacking trip through the eastern half of S. America, possibly starting in Caracas. Only problem is it appears Venezuelans with US passports (i.e., people like me) are getting turned away at Maiquetia. Perhaps I'll have to start the trip in Georgetown. My wife is Venezuelan and we just visited Venezuela. She entered on her UK passport and had no problems getting in. I also have a friend who entered on her US passport, again without problems. Where did you hear that Venezuelans were being turned away? Hi, This article is really interesting:D I have now taken interest in going there. I'm from Denmark so its a long trip. I would love to know what language the people speak. especially if it is so essential that you can't navigate or interact with the locals without. but I couldn't exactly locate Chuao in it. does anybody know what languages they speak?